The materials and products we manufacture at Swift Textile Metalizing LLC are used in a variety of innovative applications by customers in advanced manufacturing industries. The project highlighted here was developed for a customer in the medical industry. 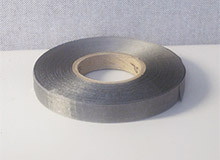 This silver coated nylon rip stop tape is used in a sensing device. The overall dimensions of the tape vary depending on their application, with widths ranging from 0.4375 inches to 1.1875 inches and lengths reaching up to 120 yards. In the development of this product, procedures were implemented to verify width, test for fraying, and to measure the electrical resistance of the tape. Dimensional tolerances for this tape are required to fall within ±0.0156" and electrical resistance must measure less than 0.5 Ω/sq. We produce approximately 90,000 yards of this silver coated tape per year in various cut to length units with a lead time of 4 to 6 weeks per run. We can develop new processes as needed to provide custom metalized fabric for any EMI/RFI shielding application. For additional details regarding this custom metalized tape project, see the table below, or contact us directly.